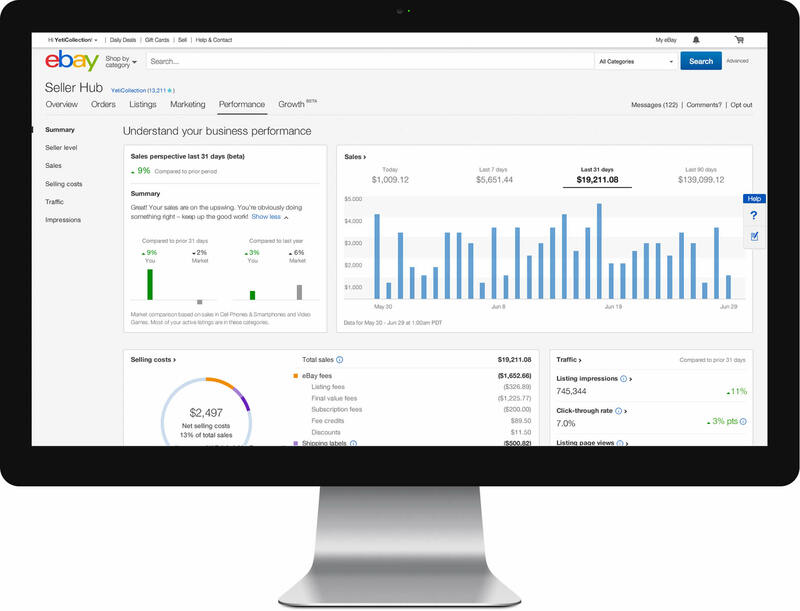 Manage and grow your business with one free tool. 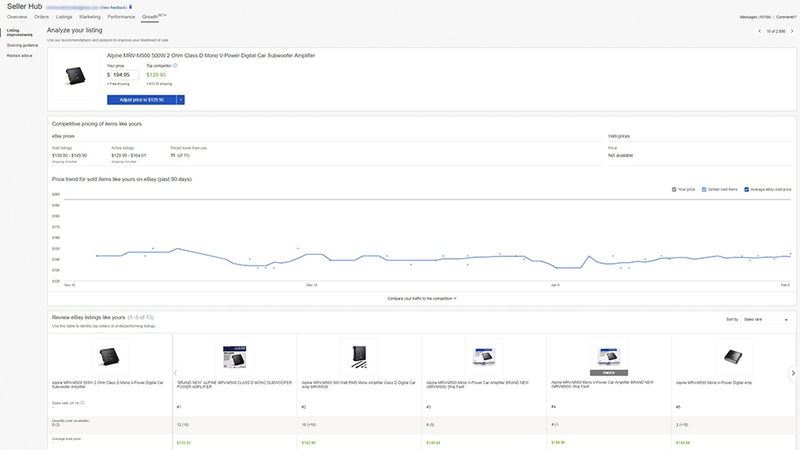 Edit active listings and manage orders with robust search and sort capabilities. I'm using Seller Hub for the first time. Will it change the way I sell? Monitor the overall status of your business. Manage your listings and orders. Monitor current performance of your business. Access insights and guidance that can help you grow your business. Which tools are included in Seller Hub? Selling Manager and Selling Manager Pro. 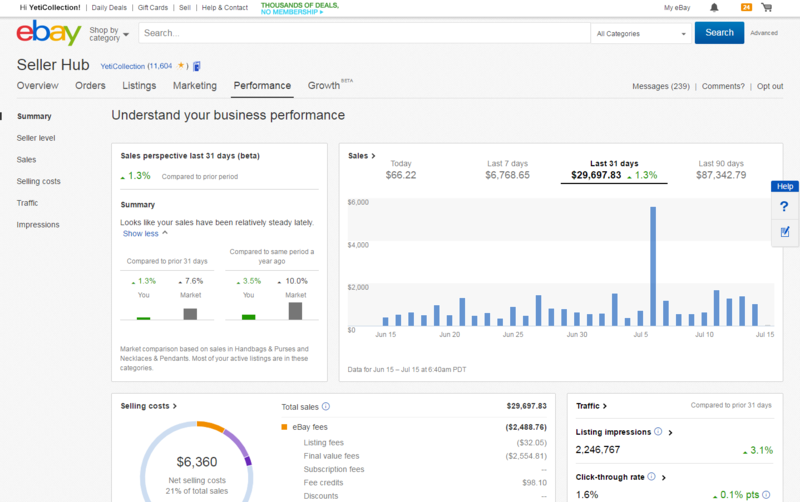 Reports and dashboards for Sales, Selling Costs, Traffic, and Seller Standards. The ability to create and edit active listings. 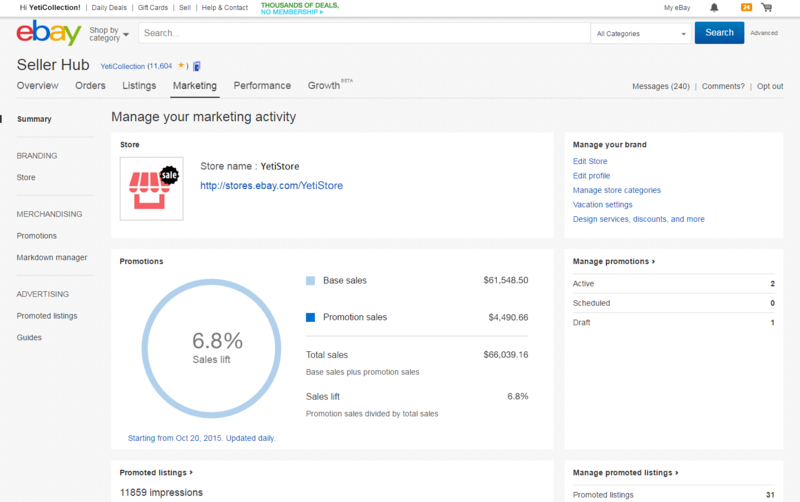 If you have a Store subscription you also get access powerful marketing tools: Promotions Manager and promoted listings. Can I opt out of Seller Hub? Seller Hub is the way for all business sellers to manage their selling on eBay. Sellers are no longer be able to opt out. Why have you removed the ability to opt out of Seller Hub? Sellers could opt out when of the beta version of Seller Hub in the fall of 2015. We announced then that Seller Hub would eventually become the way to access and manage selling. eBay has made significant investments to develop Seller Hub's features and capabilities, and we will continue to work to ensure you have the most powerful selling platform to grow your business. Can I still use Selling Manager or Selling Manager Pro? 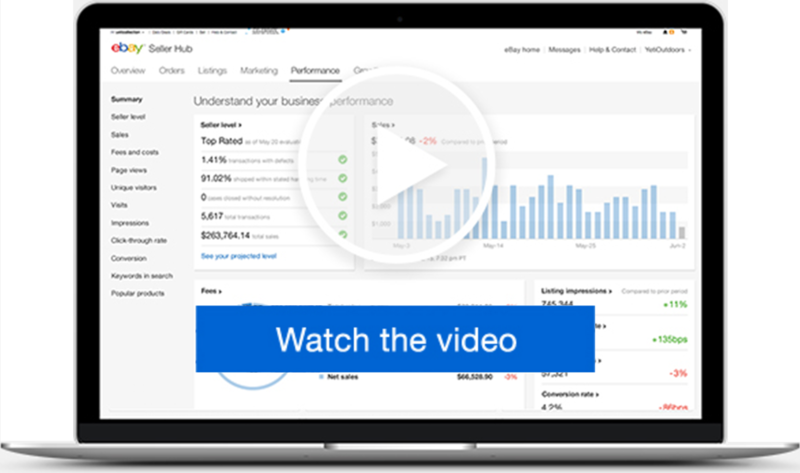 Yes, all the features of Selling Manager and Selling Manager Pro are included in Seller Hub. You now access those features from within Seller Hub. Plus, you get all the additional features and benefits of the Seller Hub at your fingertips including listings and orders management, performance and growth features, and special guidance on pricing, stocking, and in-demand inventory to help you manage and grow your business. 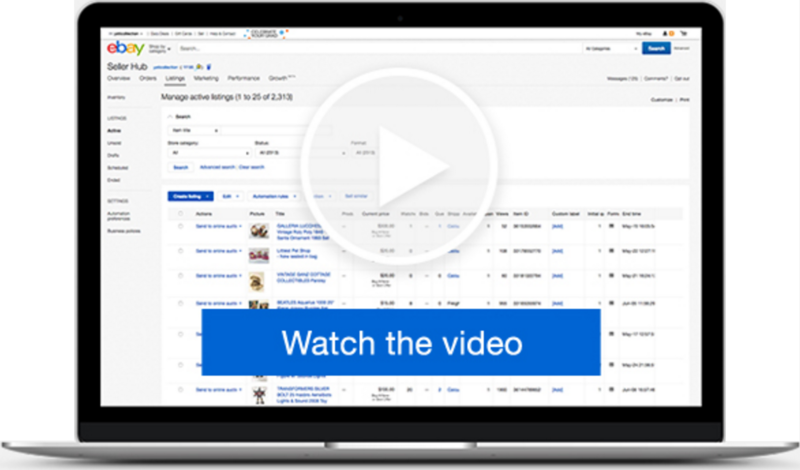 eBay Seller Hub is free to use and includes, listing, reporting and order management functionality. Existing Selling Manager Pro subscribers will continue to be charged $15.99 per month for the benefits of Pro and will have access to Seller Hub. Selling Manager Pro remains free for Premium and eBay Anchor Store sellers. How can I access my account information from Seller Hub? You can access your account information from Seller Hub by hovering over your name in the top left-hand corner, above the eBay logo, and selecting 'Account Settings' from the drop-down menu. I opted out of Seller Hub after giving it a try. What has changed or has been added to make it better now? Here is the list of new Seller Hub features we have added to help you manage your business. Mobile-friendly checker. Over 60% of transactions on eBay are touched by mobile. We've built a one-click mobile optimization tool to ensure all mobile buyers are seeing the best version of your listing possible. Look for it just above the listing description in the Seller Hub listing flow—it's truly one click. Item specifics one-click recommendations. We take data from your listing and offer real-time item specifics recommendations with a simple "add" button. It's fast, it's simple, and it will put your listing in front of more buyers. Customizable for the way you work. Don't need all those fields during the listing flow? "Customize" allows you to hide all the fields you don't want. Don't worry—you can always bring them back. Summary module. Quickly access your listings tasks, and get at a glance view of your active listing summary. "Ship by" date. eBay and your customers judge you on meeting your promised shipping dates. The new "Manage Orders" page now makes it easier than ever to meet your promise. Each 'Awaiting shipment' order now provides the 'Ship by' date, so you know exactly when you must upload tracking and get the package to the carrier. The new page (as well as the Tasks module on Overview) also provides filters enabling you to see any orders that are overdue for shipment or must be shipped within 24 hours. Buyer's name. It's now easier to see who placed an order! The new "Manage Orders" page now shows you the buyer's name as well as the buyer's username directly on the main page. Buyer's checkout notes. We've heard you loud and clear! You don't want to miss the notes buyers leave you when they check out. Seller Hub now brings these notes front and center directly on the new "Manage Orders" page. No more clicking into the sales record to read these buyer notes. Feedback. The new "Manage Orders" page now shows you – at a glance – whether a buyer has left you positive, neutral, or negative feedback. Restocking Guidance. Restock Guidance highlights all multi-quantity listings that will run out of inventory in the next 4 weeks. Seller Hub tells you how much inventory you should add to make the best of the current demand. Pricing Guidance. Seller Hub highlights your underperforming listings. A score indicates how "far away" your listing is compared to the best selling listings. To help improve your chance of sales, we provide a recommended price based on eBay data as well as external websites to help you be competitive in the online marketplace. 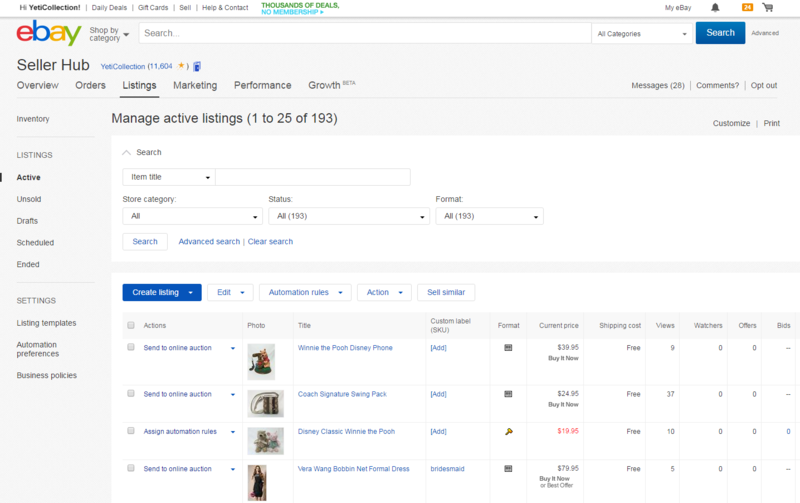 A detailed competitor overview at eBay also allows you to check if there are other areas to improve your listing, like picture quality, title, return policies, etc. Sourcing Guidance. Start selling with confidence! Sourcing Guidance allows you to browse the eBay categories and learn about the best opportunities of what will sell in the next few months. 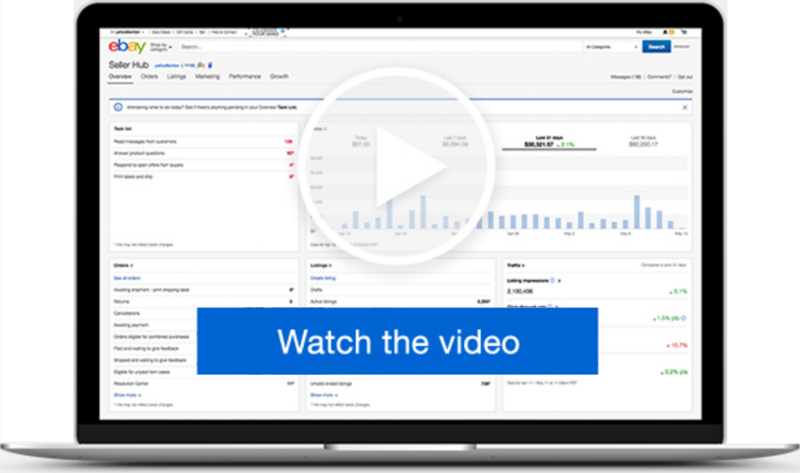 It gives you insights about where demand outgrows supply and helps you grow your business with confidence!